I have made a batch of gravlax a few months ago and I found it surprising that I am unable to finish off the rest of the salmon. Usually I will be eating a few slices every meal. Or perhaps several slices for a complete meal. But now.. I couldn’t. 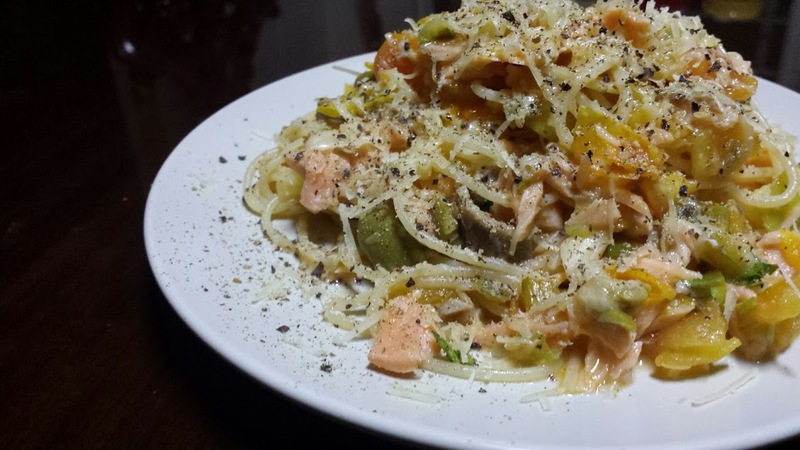 So I still had about 200 grams of unsliced frozen salmon in the freezer, just waiting to be experimented with. After cooking the oysters with pasta a couple of days ago, I realized that I can literally put anything I really want in the pasta. 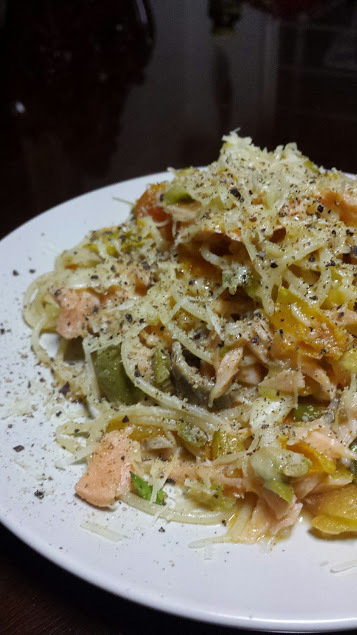 I decided to make use of the cured salmon, and amp up the health factor by adding tomatoes, leeks, and olives in the mix too. Then there’s the requisite garlic and cheese. First, I put some water for a boil for my pasta. This was about 3 cups, which produced 1/2 cup of cooked pasta. I usually just grab and guesstimate how much pasta I need. Some other people will always end up eating em anyway. While this was coming to a boil, I prepared 3 tomatoes by dicing them, 1 onion leek by slicing, a couple of garlic cloves by simply smashing and peeling, squeezing a few green olives, and slicing about 100 grams of gravlax. It all came together pretty quickly after. I dumped the spaghettini in the salted boiling water, and halfway through cooking, I started my other pan. I put olive oil, leeks, and garlic, and let everything soften. I then added the tomatoes, olives, and the gravlax. Note that gravlax doesn’t need to be cooked through, but some people prefer it like that, so it’s all up to taste. I then added the pasta then since it’s cooked by this point, along with a bit of the boiling water. Taste. I added a bit of salt, and let the water dry up mostly. I then added a few grates of cheese, then placed it on a plate. I added more cheese, and a lot of black pepper.